San Diego Car Stereo is the best car stereo installation shop in San Diego, along with offering car rims, wheels & theft prevention. San Diego Car Stereo has top of the line experts ready to get your car or motorcycle to the next level. If you need work done on your car or motorcycle, you need to contact San Diego Car Stereo in Kearny Mesa, California. WHy Come to San Diego Car Stereo for A sound system? San Diego Car Stereo specializes in installing only the very best car stereo systems into cars, motorcycles, offroad vehicles and more. We have a team of amazing staff who have decades of experience, making sure your car stereo system is in only the very best hands. 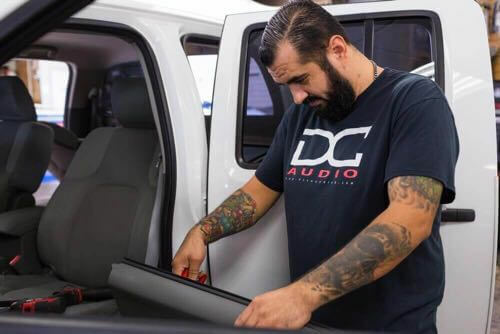 We offer custom installation of car stereo head units, amplifiers, subwoofers, speakers and other amazing products, with the craft and precision needed to get your car looking great. When people walk into your vehicle, they would never guess that you have an after-market stereo system installed into your car. Our stereo installations look as if your car came already equipped with an amazing stereo system, with flawless precision given to each and every job. If you want the very best car stereo system installation into your car or motorcycle, you need to come to San Diego Car Stereo in Kearny Mesa, California. While our namesake is our excellent car audio installation, that is not the only service we offer at our San Diego, California location. San Diego Car Stereo specializes in an abundance of services designed to make your car driving and riding experience as pleasant as possible. Need tinted windows for your car? We will keep the inside of your car feeling cool and the outside looking even cooler with an amazing custom tint job. Want to keep your car passengers endlessly entertained? Contact your friends at San Diego Car Stereo for installation of a rocking HD car TV monitor to watch yo9ur favorite movies, TV shows or videos. Want to keep your amazing car safe? Come to Kearny Mesa and we will give you a top of the line theft prevention system, complete with a security system and car alarm. That is just an appetizer of all of the amazing services we offer. Contact us for more questions. Do you have a top of the line luxury car and do not know who to trust with work and maintenance on it? San Diego Car Stereo specialize in working on luxury cars, working on brands like Maserati, Ferrari, Tesla and more. We have seen it all and received special training to work on cars of the utmost sophistication and class. We have literally seen it all and are ready to use our expertise to install a top of the line sound system into your luxury car. Are you ready to take your car to the next level? Contact San Diego Car Stereo in Kearny Mesa today! San Diego Car Stereo is centrally located in San Diego in Kearny Mesa, & we install motorcycle, car & boat stereo systems. San Diego Car Stereo is centrally located in San Diego so that it is easily accessible no matter where in San Diego you are coming from. San Diego Car Stereo offers direct routes from the 805, 163 and 15 freeway so that you can get your car or motorcycle to us with little hassle. The most unique car stereo shop you will find in Southern California. San Diego Car Stereo is the most unique car stereo shop in Southern California because we offer the ability to test your car stereo before you buy it. Anything you want to purchase for your car, motorcycle, offroading vehicle or boat will be on display in our car stereo shop in San Diego. You see it, you buy it! If you want to get a custom setup involving a variety of speakers, subwoofers and amplifiers, you can hear what the system will sound like before we begin installing it, allowing you to feel fully in control of your sound system choice. Are you ready to hear what a premium car stereo system sounds like? Come to San Diego Car Stereo in Kearny Mesa today to sample speaker systems and more from all of the best brands in car audio. Contact San Diego Car Stereo today!